I was provided with a free Rodan & Fields mini-facial in return for my honest review. All opinions are my own. Hmm, you know how there are always those things that - no matter how out there you are with yourself, how transparent or bold you pride yourself on being - you still feel self-conscious about? Well, one of mine is my skin. Recently, I was asked to try out the Rodan & Fields mini-facial. I have to say I think it was very helpful in cleaning out the pores, smoothing out the skin and giving my skin a healthy-looking sheen. Obviously I didn't use it for an extended period of time so I can't tell you if the results would have continued to improve, but based on the results I did get, I would think they would have. The first step is the Micro-Dermabrasion Paste - it scrubs great but melts into soft feeling skin that makes you truly feel like you've had a facial. There's also a lip and full body version that I would love to try. Unfortunately, my bumpiness doesn't stop at my chin. Following that you apply a Night Renewing Serum that seriously feels like you're rubbing a silk blanket against your skin. It comes in a small pod for the mini-facials and I squeezed out every last drop. It was too bad there wasn't enough for the rest of my skin. Ha! Fair warning these products are not inexpensive and will probably be a splurge for some of you. But if you're going to splurge, this is one product I could recommend. If you think of it in comparison to a facial at a spa that lasts an hour . . . you could split the container of this product with a spouse or sibling and still make it last several months! In that sense, it becomes much more economical and long-lasting. Today, you have the opportunity to win a tub of this scrub for your very own facial experience. 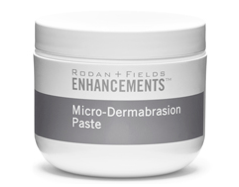 #1 - Take this survey and if you don't win the tub of Micro-Dermabrasion Paste, you will receive a sample of the mini-facial anyway! Leave a comment for each entry please. I'm super excited to see who wins . . . good luck! This giveaway will end at midnight on July 26th. The winner will be notified by email and will have 24 hours to respond before the prize will be passed on to the next name chosen.